I am recently back from a new FAVOURITE destination for Wildlife Photography - Mana Pools National Park in Zimbabwe. I am going to do a proper write-up and blog post about it in the near future, so here's just a quick PhotoShare to get you salivating. The main attraction to this place is the fact that there are huge stretches of ancient Ana and Acacia tree forests with massive trees that dwarf the elephants that roam them. Oh, and being allowed to get out of your vehicle and photograph on foot at any time also helps! Check out this image - and I'll be back soon with more!! Things are buzzing by my head now at a pace so frantic it's hard to keep up. I am heading off to Mana Pools in Zimbabwe next week, a dream destination for me. Afterwards I shall have plenty of time to wind down and catch up on things like regular blogging, etc. In the meantime - here is an image to make you think. How often do you just wish for a longer lens? We always tend to want to get the tightest, most detailed shots of our subjects...and we forget to think about shooting "wider", and placing the animal in the context of its environment. This was an occasion where I didn't have "enough glass", but it didn't bother me. I have many close-up portraits of the graceful Kudu antelope. In this instance I had parked in the middle of a road going through a dry river in the Kruger National Park. It was quiet, and I was taking in the morning sounds and smells with my window open. 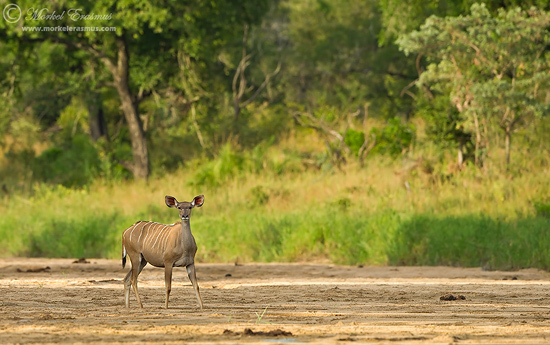 All of a sudden, a herd of Kudu came out of the dense riverine foliage and into the wide open riverbed. Kudus have a knack of surprising you, being able to stay perfectly still and hidden. Hunters have long been calling them the "African Grey Ghost". This cow paused and noticed me. I snapped a picture. This picture tells the story much better than a closer photo would have. Don't you agree?? Those of you on Google Plus (Google+) will probably have seen that people often tag photos with #PlusPhotoExtract. This is because that places the image in contention for a very intruiging "Photo of the Day" contest. Jarek Klimek from PhotoExtract Online Magazine (WEBSITE) has written an algorithm that "selects" a selection of images for the day from images that were tagged in this way. You can also check it out at a higher resolution on my 500px portfolio HERE.